A while ago, a dog went viral for learning how to use currency to purchase snacks from the school’s store. As it turns out, it’s more than possible for any particularly smart animal to learn how humans do things – but not everyone opts for the nobel, honest path! Disney’s Magic Kingdom, located in Florida, has a gift shop that recently got robbed! Yes, robbed! No, I really am quite serious about this. Have the police caught the perpetrator? Not quite – but then again, I don’t think that anyone really wants the “criminal” to be caught! This squirrel became tired of having to forage for nuts all on its own every single day. The process of searching for food to survive and stay fed became dull for it, so it decided to turn to a life of crime. One fine day, it dashed right into that gift shop and leaped onto the shelves, beginning to peruse the options. 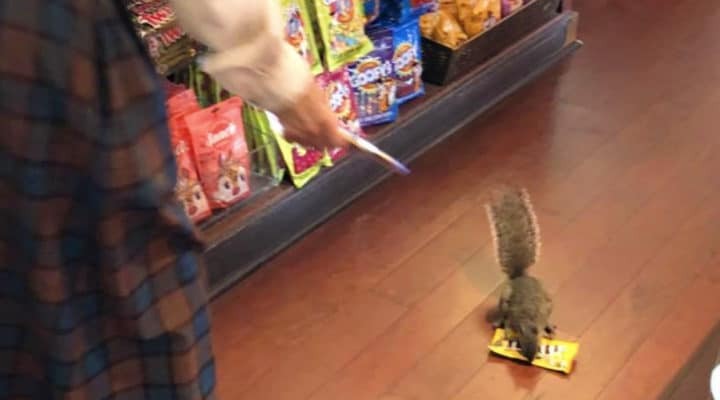 Staff rushed to shoo it away, but the brave felon ignored them, hopping around and closely examining the choice of chocolate-coated nuts. Finally, the squirrel found what it was looking for – a yellow packet of peanut M&M’s! Not only does that snack contain its favorite nuts, but also a delicious chocolate coating to satisfy its sweet tooth. With that, the squirrel bounded out of the shop, snack pack in its little hands, to enjoy its meal elsewhere. This entire incident was captured by a tourist, who whipped her phone out and recorded this video of the squirrel. 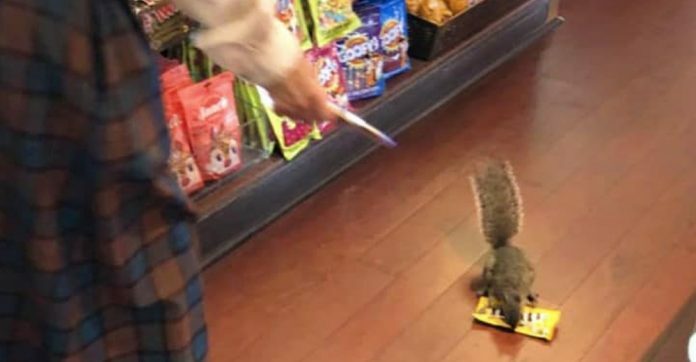 We have to assume that the squirrel had chanced upon half-filled snack bags around the area and had learned to recognize its favorite treats, and then traced them to find their point of origin. What a smart, sneaky little critter!